OK, so lets see a more exciting use for the keyboard using GLUT. In this section we’re going to go through the code of an application that will draw a small world populated with snowmen, and we’re going to use the direction keys to move the camera in this world. The left and right keys will rotate the camera around the Y axis, i.e. in the XZ plane, whereas the up and down keys will move the camera forward and backwards in the current direction. The code for this sample application is now presented with comments where appropriate. First we need some global variables to store the camera parameters. The variables will store both the camera position and the vector that gives us the aiming direction. We will also store the angle. There is no need to store the y component since it is constant. Next we have the new render function. It contains all the commands to draw our little world. Another change is in the gluLookAt function. The parameters of the gluLookAt function are now variables instead of fixed values. Just in case you aren’t familiar with this function, here goes a brief explanation. The gluLookAt function provides an easy and intuitive way to set the camera position and orientation. Basically it has three groups of parameters, each one is composed of 3 floating point values. The first three values indicate the camera position. The second set of values defines the point we’re looking at. Actually it can be any point in our line of sight.The last group indicates the up vector, this is usually set to (0.0, 1.0, 0.0), meaning that the camera’s is not tilted. If you want to tilt the camera just play with these values. For example, to see everything upside down try (0.0, -1.0, 0.0). As mentioned before x, y, and z represent the camera position so these values correspond to the first vector in gluLookAt. The second set of parameters, the look at point, is computed by adding the vector which defines our line of sight to the camera position. Now where ready for the function that will process the arrow keys events. We’re using the left and right arrow keys to rotate the camera, i.e. to change the vector that defines the line of sight. The up and down keys are used to move along the current line of sight. Just like if we wanted to convert from Polar coordinates to Euclidean coordinates. The lz is negative because the initial value is -1. Note that the camera doesn’t move when updating lx and lz, the camera position remains the same, only the look at point is altered. The fraction is a possible speed implementation. We know that (lx,lz) is a unitary vector (as mentioned before, its a point in the unit circle), therefore if the fraction is kept constant then the speed will be kept constant as well. By increasing the fraction we’re moving faster, i.e. we’re moving farther in each frame. Next follows the code for the main function using GLUT. The only news in here is the depth test enabling. Can you please tell me how to strafe the camera in all four directions?…I have been trying but couldn’t find much success. Hi, straffin is the same as moving forward/backward, but using the right and up vectors instead of the view direction. Consider the gluLookAt function with the three vectors/points: position, look at point and “up” vector. To determine the right vector just perform a cross product between the view direction (look at point – position) and the “up” vector. To compute the real up vector another cross product between the right and view direction is enough. Just set the fraction to whatever value yuo require. As real numbers include natural numbers this works for ints as well. “The lz is negative because the initial value is -1”. Could anyone explain it for me? I’m assuming that the camera initial angle is zero, and the initial looking direction is the negative Z, it is just a convention, you could do it in many different ways. My snowmen don’t look like the snowmen in your picture – they don’t look 3D. I presume you’re using shaders to produce that effect. Is this covered in another tutorial? Thanks. The first rotation you mention is useless. I took it off. Thanks for letting me know. As for the magnitude, it is irrelevant. Only the direction is meaningful. We are changing angle variable, and I don’t see the code, that use it as argument or sth. When I comment angle changing in processSpecialKeys, then camera doesn’t change. Could You explain (maybe I miss sth in previous chapters) where angle is used? this a bit of prog….and i need to design a game where a man is standing at one end that is at the starting of the screen and on the background the blocks will be moving as u can see here i want to give it a keyboard use…plz help me……to do so by pressing "a" in the keyboard the man should go up…like this…plz help me…. Seems like it will be useful since there was actually quite a lot changed since the last version. this code is not working sir plz help me . %$&# yeah… This is best tutorial I have ever got… THANKS MAAAAN!!!! And now I see this site doesn’t show the includes properly because of the greater then and less then brackets having a conflict. That I see is part of the problem here on this website. Hard for anyone else to learn to know what libraries are needed. Good thing I knew what you needed. For your code to work, make sure the following is ADDED to the top, but change what I spelled out with the actual symbol. Greater then and less then signs. @ Zoe, Here you go, your code has been fixed. Turns out, you had more then one problem with this code. First off, your screen position was set way out to 8000+ for both X and Y. So I fixed that with 1024×768 as a screen resolution and set the window position to 1,1. The 1,1 is where on your screen it will show up, which in this case will be the top left. The other problem is, you didn’t supply the Math.H file or any includes. You just show # Include, and that’s all you had. So that’s been fixed. If anyone feel like debugging please help! I am trying to make camera moves like this tutorial in a simple solar system model but it doesn’t work. I’ve tried to put glulookat at different positions in my code but still nothing. #include // Header file for standard file i/o. #include // Header file for malloc/free. Extremely helpful tutorials mate. Thanks a lot. hi, can you please explain about the calculations in processSpecialKeys function in more depth? what if I want to change the starting direction of the camera? what should be the angle and the corresponding vector? Thank you for the tutorial, very nicely explained. But my math is quite weak when it comes to vectors and angles. I got the code to work and am having a lot of fun with this. 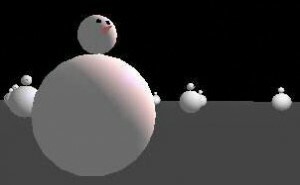 But the snow man does not have any lighting effects on it like your picture. My snow man is only a flat color. Am I missing something? No, you’re not missing anything. I kept the source code as simple as possible, hence no lighting. Oh boy did he trick you. You get a flatted sample code. The initRendering() function is completely missing. glEnable(GL_LIGHTING) enables shades & glEnable(GL_LIGHT0) enables colors and more that I am still discovering. Yes, that works in VS2010. Thanks, I’ll update the setup page. I’m not providing the full source code in here, just the modifications from the previous example. some functions cant be called… what are the libraries which needs to be included?